You'll want to check out Center Harbor in New Hampshire, if you're looking for a quiet relaxing time at Lake Winnipesaukee. You won't find the hustle and bustle of larger towns and cities here. This small community got it's name from two places. It is situated between Meredith and Moultonboro harbors. It is also named the Senter family who owned a large amount of property in the town. Years ago, steamers and stagecoaches would stop here, making this town a popular tourist area. The New Hampshire Music Festival makes its headquarters here and you can find a wonderful museum called the Village Schoolhouse Museum located on Route 25B. The museum is open on Saturdays in July and August. During the winter months, the M/S Mount Washington, the largest boat on Lake Winnipesaukee is docked here until it's shakedown cruise after 'ice out'. Reviews of the Center Harbor area. There are some hiking trails that start in in this town and go around Squam Lake. They are maintained by the Squam Lakes Association. You will find the Chamberlain-Reynolds Memorial Forest trails. This is a 157-acre forest with over a mile of waterfront. Hike the four miles of trails, stop at one of the beaches or walk across the swamp boardwalk. Dogs are allowed but must be on a leash. The Belknap Woods is a 90-acre forest at the mouth of Dog Cove. There is carry in boat access for canoes and kayaks. You'll find many trails for hiking, mountain biking, snowshoeing and cross country skiing. Plus, you can find New Hampshire Audubon trails in Center Harbor. The trail start is located off of Centre Harbor Neck Road. Beach and boat launch access is only available to town residents and their guests. But, there are plenty of hiking trails for everyone. This central New Hampshire town also holds a summer band concert series. 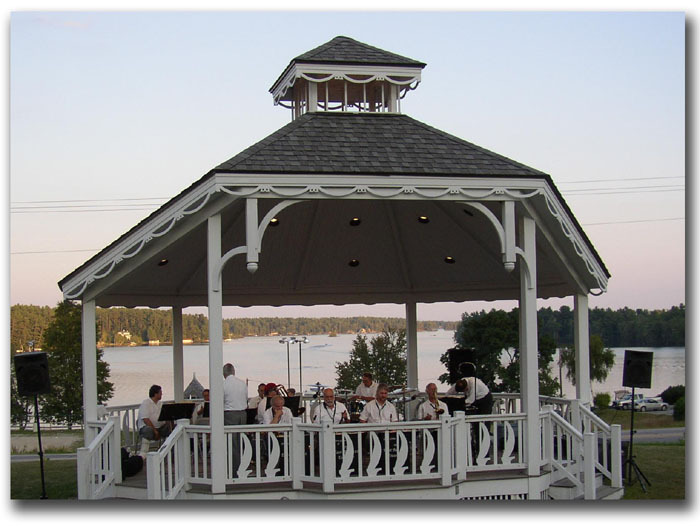 These are located at the bandstand on Friday evenings at 7pm in July and August. You can find the schedule at the town website.